Black Diamond Canada has a new contest available, and just for entering, there is a new coupon that you can gain access to! 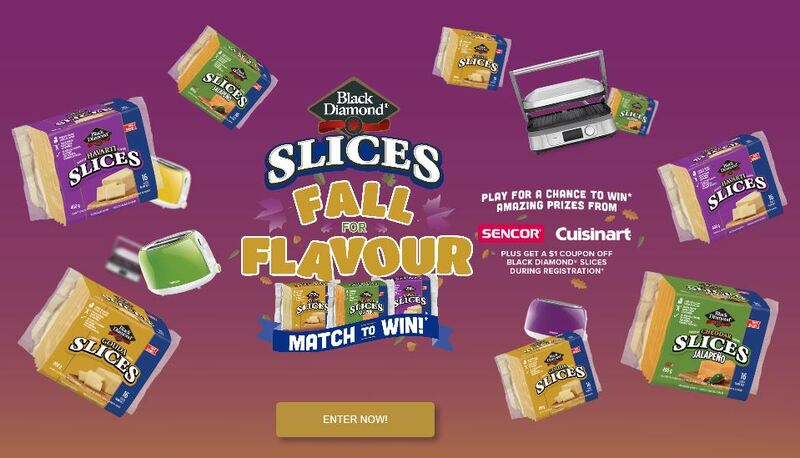 Enter the Black Diamond Canada Fall For Flavour contest, and get a printable coupon for $1 off your next purchase of Black Diamond Cheese Slices. The coupon is valid on the new flavours of Black Diamond Cheese Slices, which are Jalapeno Cheddar, Havarti, and Gouda 400g. The coupon has a long expiry and is valid until March the 31st, 2019. This gives you plenty of time to find an excellent deal to use your coupon with. By entering, you will be eligible to win prizes from Sencor and Cuisinart, so be sure to complete the match game after you have printed your coupon. Click here to register for the contest and get access to your coupon for $1 off the purchase of new Black Diamond Cheese Slices.